Chase Ramos (3) brings the ball upcourt for Madison College during its game against Elgin Community College on Dec. 5. After rallying from a 22-point deficit to force overtime, the Madison College men’s basketball team was unable to grab a victory at home on Dec. 5. Elgin Community College outscored Madison College, 15-9, in the overtime period to defeat the WolfPack, 96-90. Three players scored in double figures for Madison College, led by Kristian Zimmerman’s 22 points. Chase Ramos scored a season-high 18 points, while Tyler Meier finished with 14. The loss dropped the team’s record to 3-7. Madison College has one game remaining before holiday break, at home on Dec. 11 against UW-Waukesha. The team will the start January with three-straight home games. After a back-and-forth game that saw five lead changes, Madison College prevailed for its first win in three weeks as it beat Western Technical College, 64-63, on Dec. 2. 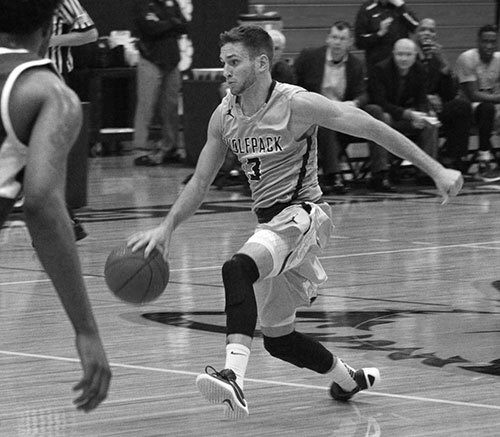 Kristian Zimmerman scored a game high 19 points, including four consecutive free throws at the end of the game that allowed the WolfPack to secure the victory. Zimmerman also had nine rebounds, five assists and three steals. Cortez McCree had 10 points and eight rebounds for the WolfPack. Madison College had 15 offensive rebounds in the game, providing the team a needed boost. Despite never challenging for the lead in the second half, Madison College was able to keep its game against second-ranked Rochester close before falling 74-63 on Nov. 24. Rochester jumped out to a 10-point halftime lead and never trailed in the second half. Madison College hit just 32 percent of its shots in the game and were out-rebounded 46-36. Malik Henderson led Madison College with 20 points on 7 for 11 shooting from the field.